A theory of physics is not an explanation; it is a system of mathematical oppositions deduced from a small number of principles the aim of which is to represent as simply, as completely, and as exactly as possible, a group of experimental laws. 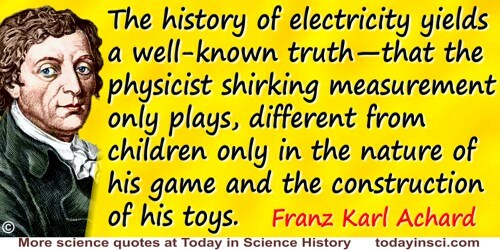 As quoted in Philipp Frank, Modern Science and its Philosophy (1949), 15, which cites Théorie Physique; Son Objet—Son Structure (1906), 24. Exactness cannot be established in the arguments unless it is first introduced into the definitions. In Science et Méthode, as translated by Francis Maitland, in Science and Method (1914), 123-124. In 'The Future of Data Analysis', Annals of Mathematical Statistics (1962), 33, No. 1, 13-14. How often might a man, after he had jumbled a set of letters in a bag, fling them out upon the ground before they would fall into an exact poem, yea, or so much as make a good discourse in prose. And may not a little book be as easily made by chance as this great volume of the world. In The Works of the Most Reverend Dr. John Tillotson (1714), 15. In Leaves of Grass (1855), 28. In all that has to do with the relations between man and the supernatural, we have to seek for a more than mathematical precision; this should be more exact than science. In Gravity and Grace, (1947, 1952), 186. 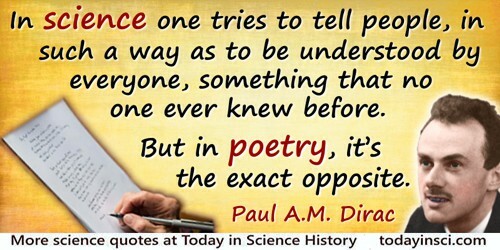 In science one tries to tell people, in such a way as to be understood by everyone, something that no one ever knew before. But in poetry, it’s the exact opposite. As quoted, without citation, in Robert Jungk and James Cleugh (trans. ), Brighter Than a Thousand Suns: A Personal History of the Atomic Scientists (1958), 22. The writing of poetry by Robert Oppenheimer was being remarked upon by Dirac, as he was talking with him. In symbols one observes an advantage in discovery which is greatest when they express the exact nature of a thing briefly and, as it were, picture it; then indeed the labor of thought is wonderfully diminished. In letter to Tschirnhaus. As quoted in George F. Simmons Calculus Gems (1992), 156, citing Dirk Jan Struik, 281-282. Life is not an exact science; it is an art. In Samuel Butler and Henry Festing Jones (ed. ), 'Reconciliation', The Note-books of Samuel Butler (1912, 1917), 351. (1923). Quoted, without source, in E.T. Bell, Men of Mathematics (1937), Vol. 1, li. Mathematics … is necessarily the foundation of exact thought as applied to natural phenomena. Only science, exact science about human nature itself, and the most sincere approach to it by the aid of the omnipotent scientific method, will deliver man from his present gloom and will purge him from his contemporary share in the sphere of interhuman relations. Poetry is as exact a science as geometry. In Letters of Gustave Flaubert (1951), 81. The discovery in 1846 of the planet Neptune was a dramatic and spectacular achievement of mathematical astronomy. The very existence of this new member of the solar system, and its exact location, were demonstrated with pencil and paper; there was left to observers only the routine task of pointing their telescopes at the spot the mathematicians had marked. In J.R. Newman (ed. ), 'Commentary on John Couch Adams', The World of Mathematics (1956), 820. The electrical engineer has an enormous advantage over other engineers; everything lends itself to exact calculation, and a completed machine or any of its parts may he submitted to the most searching electrical and magnetic tests, since these tests, unlike those applied by other engineers, do not destroy the body tested. From Opening Address, Engineering Section, British Association meeting, Belfast. ,In Norman Lockyer (ed. ), Nature (25 Sep 1902), 66, No. 1717, 536. The method of scientific investigation is nothing but the expression of the necessary mode of working of the human mind. It is simply the mode at which all phenomena are reasoned about, rendered precise and exact. In 'Method of Discovery', On Our Knowledge of the Causes of the Phenomena of Organic Nature (1863), 56. Also in excerpt collected in in Isabel S. Gordon and Sophie Sorkin (eds. ), The Armchair Science Reader (1959), 263. The only way in which to treat the elements of an exact and rigorous science is to apply to them all the rigor and exactness possible. Quoted in De Morgan, Trigonometry and Double Algebra (1849), Title page. The whole art of making experiments in chemistry is founded on the principle: we must always suppose an exact equality or equation between the principles of the body examined and those of the products of its analysis. There is plenty of room left for exact experiment in art, and the gate has been opened for some time. What had been accomplished in music by the end of the eighteenth century has only begun in the fine arts. Mathematics and physics have given us a clue in the form of rules to be strictly observed or departed from, as the case may be. Here salutary discipline is come to grips first of all with the function of forms, and not with form as the final result … in this way we learn how to look beyond the surface and get to the root of things. Quoted in The Bulletin of the Atomic Scientists (Feb 1959), 59, citing Bauhaus-Zeitschrijt (1928). We love to discover in the cosmos the geometrical forms that exist in the depths of our consciousness. The exactitude of the proportions of our monuments and the precision of our machines express a fundamental character of our mind. Geometry does not exist in the earthly world. It has originated in ourselves. The methods of nature are never so precise as those of man. We do not find in the universe the clearness and accuracy of our thought. We attempt, therefore, to abstract from the complexity of phenomena some simple systems whose components bear to one another certain relations susceptible of being described mathematically. In Man the Unknown (1935), 8. Were the Greeks scientists? Then so are the modern chiropractors. What they had of exact knowledge, in fact, was mainly borrowed, and most of it was spoiled in the borrowing. From book review (of The Cambridge Ancient History, Vol. V), in the American Mercury (Oct 1927), 254-55. Collected in A Mencken Chrestomathy (1949, 1956), 215. Working is thinking, hence it is not always easy to give an exact accounting of one’s time. Usually I work about four to six hours a day. I am not a very diligent man. In Cosmic Religion: With Other Opinions and Aphorisms (1931), 105. [The] subjective [historical] element in geologic studies accounts for two characteristic types that can be distinguished among geologists: one considering geology as a creative art, the other regarding geology as an exact science.